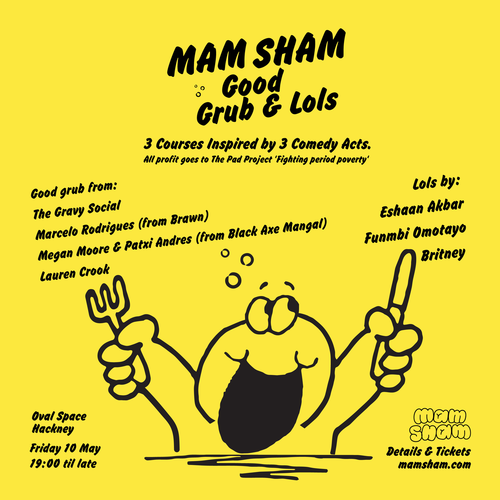 Bringing you the good grub Mam Sham have assembled a super team of their favourite guest chefs from Marcelo Rodrigues (Brawn) to Patxi & Megan (Black Axe Mangal), a recipe for big doses of intriguing, amusing and above all delicious courses. Serving up the lols our favourites from the circuit: BRITNEY (sell out / 5 star shows at Soho Theatre to Ed Fringe to Channel 4), Funmbi Omotayo (John Bishop, Black Entertainment Comedy Awards Best New Comer) and Eshaan Akbar (BBC Asian Network, sell out / 5 star show ‘Prophet Like It’s Hot’). All profit from this event is going to The Pad Project, an incredible charity fighting period poverty by giving women in India the tools to make and sell sanitary products - empowering them and keeping girls in school. Good grub, lols + good deeds. "But Mam Sham I have a dietary requirement and I don't know what the menu is!" That's right babes, as the menu is set to be revealed on the night with each course inspired by one of our comedy acts, you won't know what you're getting until it's in front of you. BUT fear not - we cater to all dietary requirements (I know what cuties right), when purchasing your ticket you will be prompted to enter any dietary requirements. Side note: Due to the nature of the kitchen we are unable to guarantee exclusion of any allergens so sadly we cannot cater to anyone with a severe allergy. Side side note: any dietary requirements not submitted will not be acknowledged. Email us if you have a last min surprise vegan.